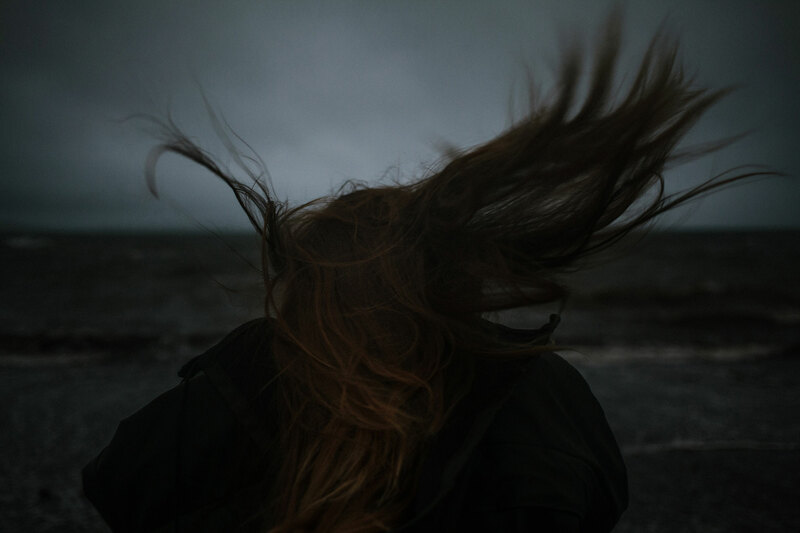 This photographic essay is inspired by the most famous legend in the Faroe Islands: The Seal Woman. As many other legends, this one has been passed on orally during the centuries. In 1891 the first faroese written version of the legend is by V. U. Hammershaimb in his work „Færøsk Anthologi I“. „Once a year, on the Twelfth Night, seals are able to take off their skins and become as similar as all the other human beings. They gather on a rocky beach to dance and play all night long. Legend says that a young man from Mikladalur heard about it and that night he decided to go down there, to find out whether it was true or not. Hidden behind a rock the man saw the seals come swimming. When they came ashore, they took off their skins and laid them on the beach. could not find her skin. Crying and weeping, she went around searching for it and, just before the sun rose, she caught the scent of her skin and eventually found it and the man. She begged him so earnestly to have it back, but he didn’t. The man rowed back as fast as he could but when he came home, his wife was gone. When the woman found the skin she was unable to control herself, so she ran down to the beach, put it on and jumped into the water again. As soon as she leapt into the sea she met her seal husband and they swam away. Ever since, when the seal-woman children came down to the shore, a seal appeared in the water and look at them. It was the general opinion that this was their mother.Many years passed without nothing to report about the man, the seal woman and their children.However, one day the men from Mikladalur decided to go to hunting seals.The night before the hunt, the seal woman came in dreams to the farmer, asking him to spare the lives of her seal-husband and her two pups. The farmer didn’t pay attention to the dream. The next day he went with the other men to the cave and they killed all the seals they found. That night the seal woman came back into the farmer’s house in the guise of a horrible troll screaming furiously:“Avenged it is, and avenged it will be on the men of Mikladalur! Some will be lost at sea, some will fall from cliffs and slopes, and this shall continue until as many have died that they can hold hands together and reach all the way around Kalsoy!”After that night no one has seen her anymore.